Commissioned by Harry Hudson, owner of the late Two Moons Trading Company. 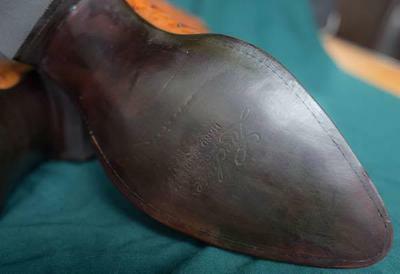 Especially made by Lucchese's Custom Division, with whom Harry had very good connections. Some of the "fullest" full-quill Ostrich you've ever seen was used for the vamps, with only slightly less dramatic quill Ostrich on the heavily-stitched 12.5" uppers. 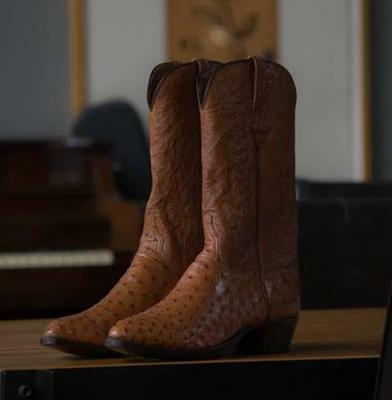 Worn once, walking briefly in Snider Plaza, just outside the store; on the day the boots arrived from Lucchese. Stored in a wooden box in my closet since then. 1.5" walking heels. Inside top of each boot monogrammed with the letter "M". Then, that was for something else. Now, it's for "Mother". I will only sell to those who can pick up in the Dallas, TX area. These boots will not be shipped. PS I also have three other pair for sale, nearly as virginal. Two pair from Rusty Franklin, and one from Billie Pickard. Please check them out here.